Primary navigation bar is located in the upper part of web site, below the logo of the service. It is the navigation bar with the main categories present on the website. If you have more items than could be displayed on your device, a More icon will contain additional menu items. Primary Navigation is a so-called "sticky" navigation, which means, that when the viewer scrolls down the page out of the view of the navigation, Primary Navigation Bar attaches itself to the top of the browser window and scrolls along with the page. In order to set up the Primary Navigation, go to the Settings tab, select Navigation Menu - Responsive and from there pick the Primary Navigation option. There you can create New Menu Items and/or edit or delete existing ones. You can adjust the order in which the items on the menu appear. 2) Specify "Link Text" - here you can specify what the new menu item will say on the frontend of the page (e.g. "Home", "Sport", etc.). 3) 1st Column Submenu - create a drop-down menu for any of the items in the Primary menu. 4) Hide Item - option to have the item appear in the list of Primary Navigation Menu items in cms, but hide it from appearing on the frontend of the website. Audio navigation bar is located below the Primary navigation bar and it's purpose is to provide live audio content. Because of this, Audio navigation bar is directly connected to Audio Scheduler feature in Pangea. It consist of 3 drop-down columns. All 3 columns can contain the variety of content (links, articles and multimedia), that can be set and swapped, same as for Primary navigation bar. 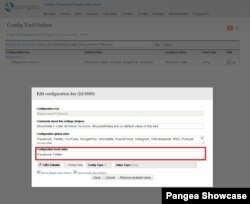 If the web site is using the Pangea Audio Scheduler, 1st and 2nd column is reserved to display Audio Scheduler information. 1st column usually displays which show is currently being broadcast, while 2nd column shows the upcoming programs. Keep in mind, that Audio navigation bar is not enabled by default on web site. 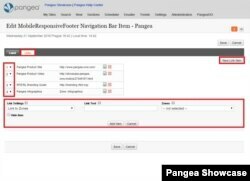 If you need navigation bar enabled, send a request to Pangea Internet team. In order to set up the Audio Navigation, go to the Settings tab, select Navigation Menu - Responsive and from there pick the Audio Navigation option. Video navigation bar is located below the Primary navigation bar and it's purpose is to provide live video content. Because of this, same as for Audio navigation bar, Media navigation is directly connected to Video Scheduler (Internet TV program schedule) feature in Pangea. It consist of 3 drop-down columns, same as Audio Navigation Bar. All 3 columns can contain the variety of content (links, articles and multimedia), that can be set and swapped, same as for Primary navigation bar. 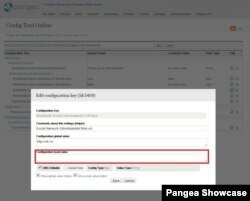 If the web site is using the Pangea Video Scheduler, then 1st and 2nd column is reserved to display Video Scheduler information. The 1st column usually displays which show is currently being broadcast, while the 2nd column is showing the upcoming program shows. Keep in mind, that Video navigation bar is not enabled by default on web site. 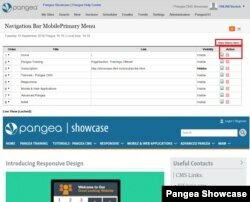 If you need navigation bar enabled, send a request to Pangea Internet team. In order to set up the Audio Navigation, go to the Settings tab, select Navigation Menu - Responsive and from there pick the Video Navigation option. Footer is located at the bottom of the web site page. Footers usually contain some additional links, like list of sections, about us, jobs etc. When you edit or create a New Item for the Footer, you work with two different tabs - Labels and Links. In Labels, you can add any new Link Text or choose to hide a certain Item. In the Links tab, you can create new Links, edit, or delete exiting ones. These will be displayed under the label you've created in the previous tab. In the Links tab, you can also adjust the order of the links in which they appear on the frontend from top to bottom under a specific label. For logged in users, a small pop-up screen displays with more information about your account when they click the button. User who isn't logged in to Twitter will see a similar pop-up screen that allows them to view your account's following/follower information, sign in, and then follow you. The social buttons that are offered can have a value that is localised (tied to your specific social media account) or global (left to redirect to the homepage of the social media in question). In order to activate the social media buttons you well need to use the "Responsive.FollowUs" Config Key. This key both allows you to change the order in which the social media buttons appear, but also enables/disables social media buttons in general. To use it, go to Administration and select Config Tools Online. In the following page, you should search for "Responsive.FollowUs". After saving the desired changes, it is necessary to reload site and CMS (upper left corner of the Config Tool Online page). To set a specific localised value of a given social media button you need to go to Administration and select Config Tools Online. (same as with Responsive.FollowUs Config key). Once there, search for the specific social media that you want to adjust (e.g. Facebook, Vkontakte, Instagram, etc.). Among the various config tools, it's necessary to find the one that's in form of "MobileSite.Social.NameofSocialMedia.UrlFollow" (e.g. "MobileSite.Social.Odnoklassniki.UrlFollow"). In the column Configuration local value in the new dialog window you can add, edit, or remove the specific URL to your specific social media account. After saving the desired changes, it is necessary to reload site and CMS (upper left corner of the Config Tool Online page).